Got an HP J720 to play with!Got an HP J720 to play with! I use a Jornada 720, now as a link between laptops etc it is so easy to move my important details over such as ebooks, addresses and favourite folders. I never travel without it as even in a cyber café I move the favourite folders etc.. (Obviously there I don’t move delicate info) I also use the jornada to check my digital pictures and send them to a server for storage while travelling. I like hand held addict as I can always find information or tips on how to use my handhelds. I am back from holiday after spending the last week in New York and so will now begin to catch up with email. Lee Cryer emailed me to ask if I had used HPC Translate. Personally I had not but have a look and see this is something that may be of use. "HPC Translate is a utility that allows the user to translate single words from one language to another. It works on Microsoft Windows-powered Pocket PCs, Handheld PCs, and Palm-Size PCs. Currently HPC Translate includes English and Spanish dictionaries. Each dictionary contain approximately 30,000 words." Anyone who wants to know more about the OQO should check out the Engadget website which has a good write up about the device. "The end game of some portable computing devices is eventually to become full-fledged versions of their desktop brethren. The Pocket PC (now called Windows Mobile) is very Windows like, but users still need to learn a new way to do the same tasks they’ve learned on the desktop on a phone or PDA; but what if there was a tiny computer which ran a desktop operating system in a form factor close to a PDA? That’s the OQO (which you should know about long before now, as we’ve been hyping this thing since forever ago) and we have a series of Gear Eye articles about this new type of computing device, which ushers forth a new era in portable desktop computing." I actually get quite a few emails about the OQO and I have to say that considering what it can do the size is brilliant. Wonder if you can help. I have just got hold of a HP 320LX. Do you know where I can download / obtain a user manual and the software / drivers? Not much on HP web site. This looks like an interesting PDA which I spotted over at Brighthand this morning. "It seems like cellular-wireless Pocket PCs are cropping up everywhere these days. However, China-based Amoi has announced one that stands out from the crowd. The G6301 will use a clamshell design. When closed, it will have a numberpad and a 96-by-64-pixel, 1.1-inch, OLED display. Above this will be a 1.3 megapixel camera. Opening it will reveal a QWERTY keypad with a horizontal orientation. On the other side of the hinge will be a 320-by-240-pixel, 2.4-inch display. " Brand new pack of two stylus pens on hand to replace those that are lost or damaged. Brand new parallel printer cable, for printing to any parallel printer from jornada. Mint Voyager VGA CF, for professional quality presentations from handheld. 2 memory CF, 1 of 48MB, 1 of 256MB of capacity. imov Messenger for Windows CE has been updated. * Communicate with AOL, ICQ, MSN, Yahoo! Messenger users! 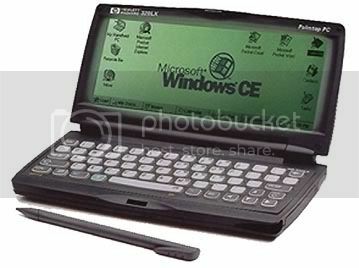 * Support for Windows CE devices! imov Messenger is a Windows CE client for the Jabber instant messaging system. The Jabber platform is expected to be the dominant instant messaging system in the near future. Runs great on HPC devices especially if you have a wifi enabled device. PDAs were virtually nowhere to be found this year at the CES according to Brian's editorial at BargainPDA. It is a shame a lot of people have been saying recently that the PDA is dead and people are moving to more smartphone devices. Personally I would rather use my NEC or 720 as I can achieve a lot more and I need to keep organized believe me. So I have a NEC MobilePro 900c Handheld PC and what do I think so far? Obtained from Expansys . It's a lovely device, the screen is crisp, the keyboard smells new, the device is rugged. I can say this it's a great device and I will be talking about it in more detail tomorrow. I have to watch out though because I keep dropping crumbs and on the keyboard as I have been playing with it since last week and cannot stand parting with it. This looks interesting at Brighthand today "SyChip has introduced a module that can be built into handhelds and smartphones that gives them 802.11g connectivity." Psion Teklogix, (LSE: PON), a global provider of solutions for mobile computing, wireless data collection and RFID, today unveiled the WORKABOUT PRO S, a Microsoft Windows CE .NET based hand-held computer that delivers the flexibility and performance of the recently launched WORKABOUT PRO, in a smaller, lightweight form factor. Adding the WORKABOUT PRO S to the Psion Teklogix Windows CE .NET product family ensures the ability to meet exact data collection needs of customers across a broad range of markets. An evolution of the WORKABOUT PRO, the WORKABOUT PRO S delivers the same customization capabilities, expansion, task-specific ergonomics, and radio and data input options in a more compact form factor. With its colour touch-screen and scanner options, the WORKABOUT PRO S is ideally suited for signature-capture and barcode scanning in direct-to-store delivery, transportation and logistics, retail, field service and other mobile applications. "Psion Teklogix is committed to offering our customers a range of mobile computing options from lightweight hand-held devices to industrial strength computers," said Thierry Beclin, director of product management and marketing, Psion Teklogix. "By expanding our product portfolio with the WORKABOUT PRO S we are continuing to solve our customers data collection challenges and are better positioned to meet the needs of the overall rugged hand-held market which is expected to grow to over $2.86 billion by 2008*." An ergonomic and compact, yet rugged hand-held computer, the WORKABOUT PRO S is built on Psion Teklogix' Windows CE .NET and the Intel XScale processor platform. It will offer a range of simultaneously supported radio options including WWAN (GSM/GPRS, CDMA), WPAN (Bluetooth) and WLAN (802.11b). With an IP54 rating and ability to withstand multiple drops from four feet to concrete, the rugged design of the WORKABOUT PRO S delivers reliable performance in harsh environments. The WORKABOUT PRO S is the next evolution of Psion Teklogix Windows CE .NET-based family of hand-held computers. When teamed with the 7535 and WORKABOUT PRO M and C, customers have the power to choose the hand-held device that best fits their needs. Further, the extended CE .NET device family that includes the 8525 vehicle mount computer and NETBOOK PRO gives customers the capability to deploy their applications across multiple form factors with inimal development effort. The WORKABOUT PRO S, like all Psion Teklogix CE .NET devices, provides customers with Intel XScale processors, 802.11 technologies, WAN capabilities Bluetooth, RFID and SNMP. The WORKABOUT PRO S can be used in batch, WLAN or WWAN implementations. The WORKABOUT PRO S will be available February 2005 in North America, Europe and Asia. I just spotted the Archos Pocket Media Assistant PMA400 over at Tekguru which looks quite cool. Got feedback for the .NET Compact Framework?Got feedback for the .NET Compact Framework? The NetCF team is looking for feedback from developers using the .NET Compact Framework for consideration in future releases. We've got lots of ideas and are looking to focus on what's important to our customers. Drawing on the PDA screen – is it really useful?Drawing on the PDA screen – is it really useful? Originally from BobR, at MobileRead: "Was reading the recent post about riteMail software that lets you email drawings from your PDA, email it and then process it on the desktop. That got me thinking about how I never found it very reasonable to draw much of anything on my PDA screen. I feel like I could do so much if my PDA was like a real notepad of Post-it notes. But it always feels like I was drawing on my PDA with a crayon on a tiny piece of paper. Must be something to do with the resolution of the digitizers. In fact, I remember hearing somewhere that the digitizer resolution can often be much less than the screen display resolution. So if we could design the next PDAs, better digitizing gets my vote for a needed improved hardware feature." According to Tekguru: "riteMail, the first unified note taking application, and one of my favorite apps has sneaked an update onto the market..... " "riteMail is the first unified note taking application that enables users to take handwritten notes on their mobile devices on all major platforms, transmit notes to any email address, and then process and recognize them on desktops. The versatile riteMail delivery system displays handwritten letters, drawings and charts in the body of email messages in all popular corporate and public mail systems. riteMail Web Edition works with any Java™-enabled browser and allows recipients to instantly respond to the received handwritten messages in their own handwriting without having to download and install any special software. Used by people in over 120 countries, writing in more than 50 languages, riteMail is a new communications metaphor for the mobile wireless world and an infrastructure for unified note-taking and Advanced Notes Recognition (ANR)." Ritemail is available for the HPC. Microsoft announces MSN Video Downloads, not sure if it works with Windows CE but I hope it does. "With content such as sports highlights, news headlines, children's programming, music videos, independent films and comedy shows, MSN Video Downloads is the first online video download service dedicated to portable entertainment. Starting from 6 January consumers can participate in a preview of the service and access videos from more than a dozen of Microsoft partners." More details at Geekzone. Spotted over at Engadget this morning regarding the OQO. "Last night at the ShowStoppers conference our man Peter got some face time with OQO’s co-founder Jory Bell to talk a bit about the OQO Model 01, upcoming OQO Model 02, and to see what’s next for the company that redefined ultraportable computing. Check it out!" More details. Engadget has news that Seagate is working on a 5GB CF drive. "They said way back in June that they were working on this, and Seagate has finally unveiled their new 5GB CompactFlash drive. The 1-inch drive, which’ll also come in a 2.5GB version, should be out next month and is mainly aimed at pro digital photographers who can never have enough storage space for all those RAW image files (though we’re betting this thing will also start showing up in portable media players and maybe even camcorders and PDAs before too long)." Activesync 3.8 has just been released. You can get it here. I know a lot of you were either previous Psion owners with a number of you still owning the device. You may be pleased to know that 3lib have updated the 3-Lib Psion CD. "every piece of useful Psion freeware or shareware ever released, plus loads of archive extras. Two handhelds to review, the NEC MobilePro 900C and the Nokia Communicator 9500 over the next few days . There will be more information over the next few days. Meanwhile Stuart Denton emailed me to say that he has got his hands on a device and will be sending his thoughts in, I look forward to reading them Stuart. We have not looked into HPC Factor for a while and I took a look at their site this morning and there is some great content including a review of Bubblets which is a great jawbreaker clone. Indeed a great game. Good to see iSilo™ updated with added image map support. "iSilo™ is a highly versatile document reader available for Palm OS®, Pocket PC, and Windows® CE Handheld PC handhelds, as well as for Windows® computers. You can find thousands of ready-made documents downloadable immediately for reading with iSilo™ or you can create your own documents from HTML content using iSiloX. " According to webblog India Defense, Indian army soldiers will soon be carrying indigenously developed handheld PCs called ‘Sathi’. "The new device has been developed by a Bangalore based firm, Encore Software, which had earlier designed India’s first handheld computer. The company informs that ‘Sathi’ is an integrated battle computer with Global Positioning System (GPS) and radio, customised Geographical Information System (GIS) whilst enabling field sketches with a customised symbol library for map marking." Running out of ebooks on your HPC to read this holiday? Why not take a wander to the Project Gutenberg website. " Project Gutenberg is the oldest producer of free electronic books (eBooks or etexts) on the Internet. Our collection of more than 13.000 eBooks was produced by hundreds of volunteers. Most of the Project Gutenberg eBooks are older literary works that are in the public domain in the United States. All may be freely downloaded and read, and redistributed for non-commercial use." A good resource? Handheld Addict tends to think so. Sammy for Christmas I received a second hand J720 thanks to my wife and of course ebay. I have been following Handheld Addict for some time, your site and Henri's software site are the best resources for HPC enthusiasts on the internet. I have followed the forums very closely too. If it wasn't for you and Henri I would not be say here typing this on my dream device, so thank you for the best Christmas present.